If you’re considering HVAC replacement, chances are that this is your first time facing such a project and you’re not quite sure what to expect. That’s why we’ve come up with all the helpful information you’ll need, from working with an HVAC contractor and installer to tips that will help you prepare your home before the HVAC replacement project begins. Before you start the replacement, it’s recommended that you get up to four HVAC replacement cost estimates from reputable HVAC contractors or companies. Upon arriving at your property, the HVAC contractor will measure square footage and perform load calculations based on your area’s climate, the size of your property and condition of the structure’s envelope, or its ability to contain conditioned air. After completing the assessment, the contractor will recommend the size and type of HVAC system, as well as any necessary repairs to the ductwork and/or exterior envelope. The recommended HVAC replacement may include upgrading attic or crawl space insulation, resealing of windows and doors, or repairing breaches in exterior walls where conditioned air might escape. It is recommended when replacing one part of the system, whether the HVAC compressor or the air handler, to update both systems and, at a minimum, have the ductwork inspected in case it needs replacing. Although only one part of your system may need replacing, it’s recommended that you replace the entire system to maintain maximum system efficiency. Replacing the entire HVAC system means spending more money upfront but you’ll save money in the long run because your entire HVAC unit will be in sync. 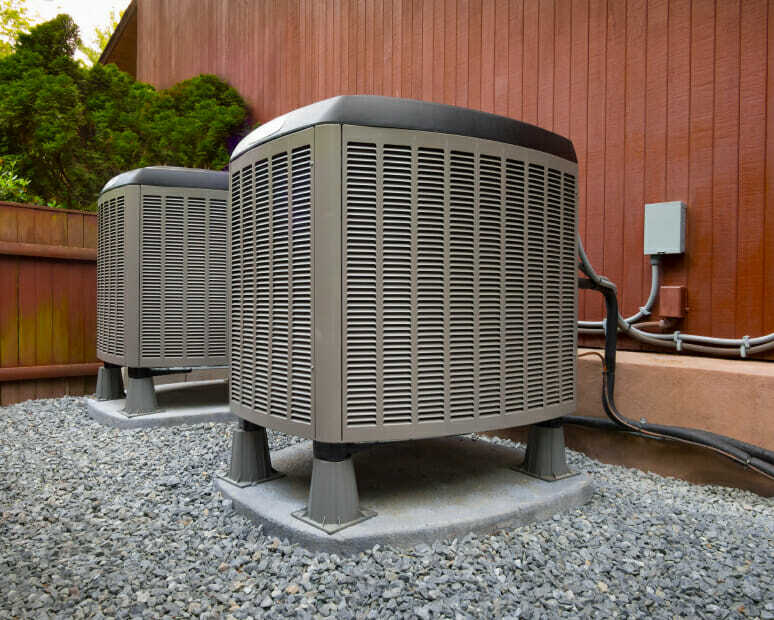 Before buying for HVAC replacement, do your research on the best type and size unit for your property. Purchasing a unit that is too large or too small for the square footage of your home or business is not energy efficient, which results in higher utility bills. Check the energy efficiency ratings on the label and whether the product is certified by Energy Star to ensure you buy the system that will work at maximum efficiency, year-round, and save you money throughout the lifespan of the system. You’ll want to know these terms before deciding on the best replacement HVAC unit for your home. HSPF – Heating Season Performance Factor: This rating determines the efficiency of a heat pump. The current standard that all new heat pumps must have is a minimum of rating of 7.7. SEER – Seasonal Energy Efficiency Ratio: This rating notes the efficiency of the cooling system. The current rating is set at a minimum of no less than a 13 for all new systems. Make a list of licensed, insured, and bonded HVAC contractors in your area then schedule a visit for each contractor. – Allow each to take measurements & inspect your current system. Ask for proof of current HVAC license and insurance.You need the license number so you can do a follow up to ensure the license is active as well as their insurance. – Removal of old HVAC unit costs. – Know what’s included in your warranty. There are several things you can do before the installation crew arrives that can speed up the process. Move valuables such as antiques and irreplaceable objects to a safe location. Many contractors are uncomfortable when asked to move expensive items from work areas, as they do not want to be liable in the case of an accident. In addition, if you have pets, move them to a safe, quiet location away from expected work areas. Now that the estimate is complete and you have chosen an HVAC contractor and new system based on their recommendations, you’re ready to move forward with the installation. While most HVAC system replacements can be completed within a day, some more advanced additions could extend the installation into the next day. Upon arriving at your property, the HVAC contractor and crew—usually one or two assistants—will assess the job site and begin setting up their work areas. First, the crew will protect all flooring in applicable work areas by laying drop cloths and/or protective paper. Next, they should move furniture and other household belongings near the work areas to a safe location and out of the way. Because there may be some dust created during the installation, heavy furniture and other household items that cannot be moved should be covered with plastic for protection. After ensuring all flooring and household items are protected, the crew will bring in their tools and begin the project. Before replacing your new HVAC system, the crew must first replace the old equipment with your new air conditioner and heating unit. This may involve gaining access to attic areas, crawl spaces, and basements that typically house the HVAC system. After cutting the power to the HVAC unit, the crew will remove any refrigerant from the AC system and begin disassembling and removing the old equipment. Depending on the scope of your project, duct repair and/or replacement may be involved. One or two crew members will typically begin this work, while the lead installer begins assembling the new equipment. 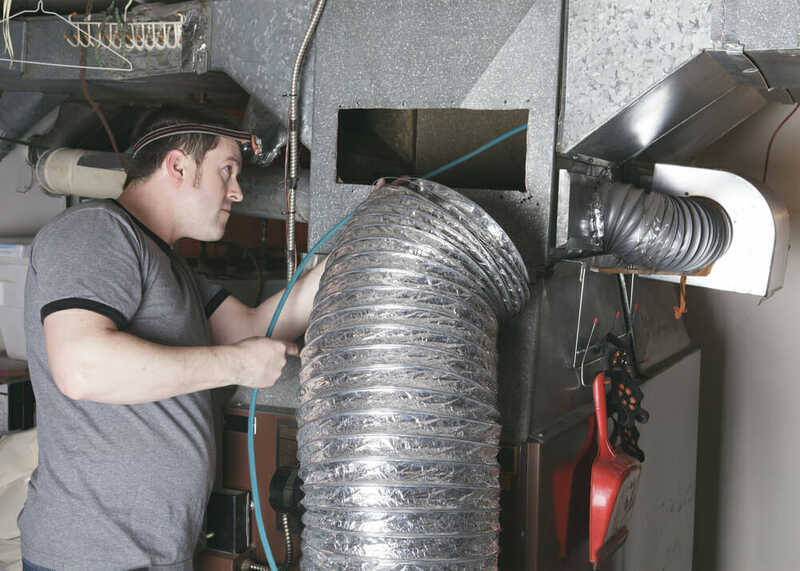 If major ductwork is involved in your HVAC project, you can expect to have crew members negotiating their way through attics and crawl spaces to make the repairs or modifications necessary for the new equipment. In addition, major ductwork could prolong the completion of the HVAC replacement, so plan accordingly. After repairing or modifying the existing ductwork, the crew will begin installing the new equipment to manufacturer’s specifications. Depending on the type of system you choose, the equipment may be installed both inside and outside your home. The components installed may include the inside air handler or evaporator, outside compressor or condensing unit, new refrigerant supply lines, thermostat, condensate drain lines, and the condensate pump when applicable. In addition, while most HVAC contractors can upgrade wiring and circuit breakers during a typical HVAC installation, major changes to the property’s electrical system and circuitry may require the services of a licensed electrical contractor. As with many home improvement projects, unexpected repairs—in addition to your written estimate—can pop up that are necessary to complete the project. These might include replacing damaged ductwork, rotten wall studs, electrical upgrades, and drywall repairs that are not included in your estimate. While most HVAC contractors will try to cover all the bases in the initial estimate, there are things that cannot be assessed until the project has started. Upon completing HVAC replacement installation, pressure and vacuum tests are performed before charging the system with new refrigerant. After a complete inspection of the new HVAC system, refrigerant is added and the system is activated and retested to ensure all components are working properly. After all testing is complete, your HVAC contractor should go over proper operation of the new system and warranty information as well as answer any questions. Then you’ll be ready to reap the benefits of a more comfortable home.